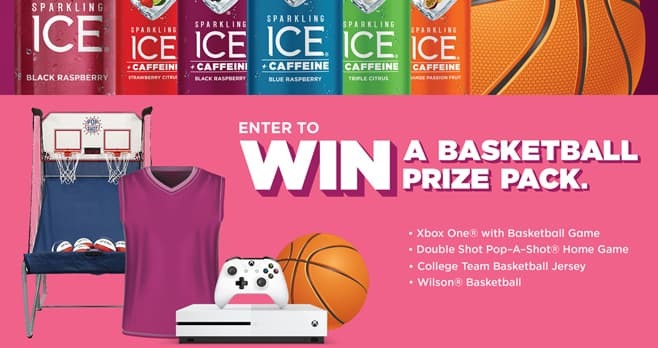 Sparkling Ice Game Sweepstakes: Text GAME to 31996 or visit game.sparklingreward.com and enter for a chance to win a basketball prize package consisting of an Xbox One with Basketball Game, Double Shot Pop-A-Shot Home Game, Wilson Basketball, and College Team Basketball Jersey. The Sparkling Ice Game Sweepstakes is open only to individuals who are legal U.S. residents of IA, IL, IN, KS, MN, MO, NE or WI and at least 18 years of age at the time of entry. The Sweepstakes begins at 12:01:00 a.m. ET on February 24, 2019 and ends at 11:59:59 p.m. ET on April 15, 2019. Limit one online entry per day (once every twenty-four (24) hours) per person during the Sweepstakes Period. The grand prize consists of a Basketball Prize Package. Visit game.sparklingreward.com to enter and see Official Rules for details.